Store flour, sugar, or other items in these sleek canisters by Sweet Home Collection. 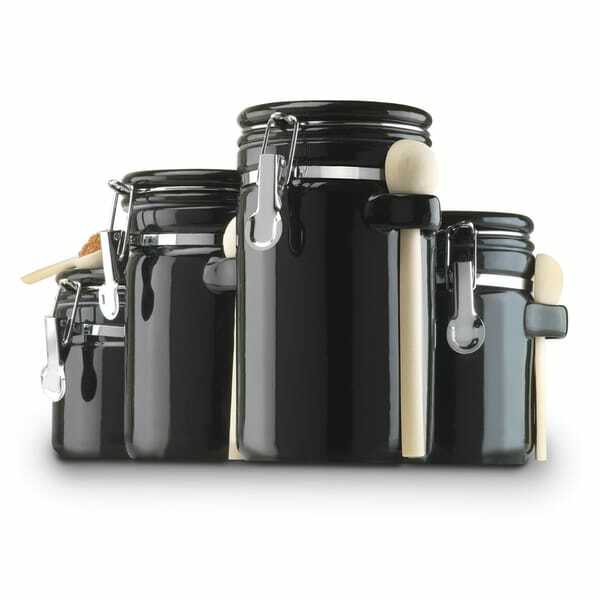 Each canister comes with its own wooden spoon and the black ceramic adds a contemporary look to your countertop. Great canisters for my kitchen counter, matches my toaster that is black, I have sugar, coffee, rice and beans in them, I just wished they were a littler bigger, they arrived fast, the packaging was hard to open and did cut myself with one of the canisters screws. Good quality nice decorative canister set! I do recommend. These look great sitting along our ceramic cook top! Very nice canister set that matches my knife set that I purchased. This is a nice canister set with tight fitting lids. They are advertised as four different sizes. They are, in fact, two pieces each of two sizes. Nice canister set, but a little on the small side. Very good for storing sugar, flour, coffee and so on. Just what I wanted to complete my kitchen counter space. 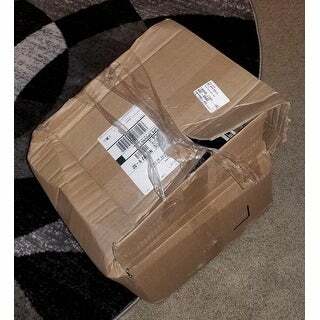 The box was damaged but thankfully the contents were not. I really like this product. If it's perfect in my kitchen. "Do these have a tight seal?" I liked the color & it is the style I'm looking for. Clean, sharp lines, 4 canisters as opposed to the normal 3, correct color. "Or there replacement gaskets that can be purchased separately for these canisters?" Hello Shoppaholic, we do apologize, we do not offer replacement gaskets for this item. Please feel free to contact us again with any further questions. Thank you for shopping with us!